In Philadelphia in the 1700s, taverns were often popular meeting places for societies and organizations. By meeting outside of a private home, club members could drink and eat well into the evening without disrupting their host. Not to mention, since tavern culture was customary for men, male dominated organizations could talk openly without having to make socially polite conversations with women. 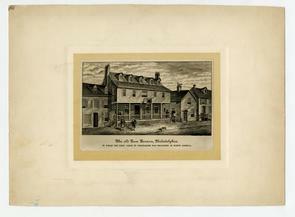 As a result, taverns, like the Tun Tavern, were immensely popular with Philadelphia’s important early organizations. The name “tun” is an Old English word meaning a barrel or keg of beer, and the Tun Tavern lived up to its name with a reputation for good food, drinks, and privacy. Established in 1685, the Tun was located at the intersection of King Street and Tun Alley, now the I-95 highway by Penn’s Landing. Its owner was one of two well-known brothers – Samuel or Joshua Carpenter. Samuel Carpenter was a successful Quaker business merchant who made his fortune through trading in Barbados. Samuel purchased an enormous amount of property on Philadelphia’s Delaware River bank, which he then used to build Carpenter’s Wharf. The Wharf was the first of its kind in Philadelphia, and could hold a ship that was up to 500 tons in size. In turn, his younger brother Joshua made his fortune by owning a brewery and successfully renting out other properties. While some researchers, like Peter Thompson, claim that Joshua built the Tavern, others argue that it was Samuel’s building. Not to mention, other authors, such as Harry Kyriakodis, suggest that the brothers may have been co-owners. Either way, the brothers must have worked together to help one another’s success. The Tun’s location would have placed itself right next to Carpenter’s Wharf, and as a result, it was surrounded by the Wharf’s thirsty sailors and merchants. Both the Tavern’s and the brothers’ respected reputations attracted organizations that were looking for places to meet. Tun was the birthplace of some of the earliest ethnic heritage associations in Philadelphia. The St. George’s Society, a charitable organization that helped struggling Englishmen that were arriving in the colony, held its first meeting there in 1720. Similar to St. George’s, the St. Andrew’s Society formed at the Tun in 1747, helping incoming Scottish immigrants settle into the City. The Tavern also has strong connections to the United States military. In 1756, Benjamin Franklin recruited soldiers at the Tun for the Pennsylvania militia in the hopes of quelling early Native American uprisings. It was later home to the founding of The United States Marines at the dawn of the American Revolution. On November 10th, 1775, the First Continental Congress commissioned Captain Samuel Nicholas to raise two battalions of Marines. The military used the Tun as a recruitment base, and its proprietor, Robert Mullan, became the Chief Marine Recruiter. The Marines still accredits the Tavern for its role in its founding to this day. Even the Tun’s celebrated reputation, however, could not prevent its demise. The Tun Tavern burned down in 1782, while several of the organizations founded there continue to thrive in the United States. Kyriakodis, Harry. Philadelphia’s Lost Waterfront. Charleston: The History Press (2011). 88-89. Thompson, Peter. Rum Punch & Revolution: Taverngoing & Public Life in Eighteenth Century Philadelphia. Philadelphia: University of Pennsylvania Press (1998). 28, 63, 66, 84-86. Watson, John. Annals of Philadelphia and Pennsylvania, in the Olden Time; being a Collection of Memoirs, Anecdotes, and Incidents of the City and its Inhabitants, and of the Earliest Settlements of the Inland Part of Pennsylvania, from the Days of the Founders. Vol 1. Philadelphia (1857). 464.